Betfair, the daddy of betting exchanges, also operates a fixed odds sportsbook. There’s not a lot to say here. As you would expect from a London Stock Exchange main market listed company, its well-managed, ultra-reliable and you money is as safe as houses, apart from perhaps those ones you see on the news on to top of cliffs, slowly seeing their gardens, and soon to be their living rooms, disappear into the sea! New customers are eligible to receive £30 in free bets having deposited and placed a qualifying bet of at least £10. This qualifying bet must be placed at odds of 1/5 (decimal 1.2) or greater. Free bets must be used within 30 days and again placed at odds of 1/5 (decimal 1.2) or greater. 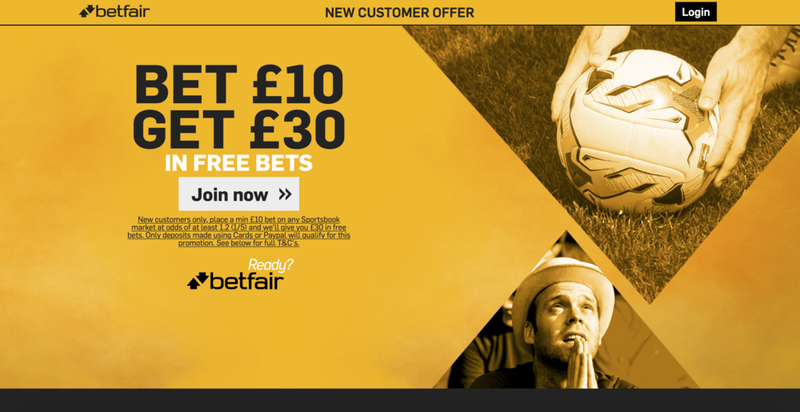 If you already have a Betfair exchange account you will unfortunately not qualify for this free bet promotion. Free bet stakes are not returned with winnings, implying high odds (more likely to lose) will be most profitable. You first need to open an account from using promotional code ZSK200 and deposit a total of £/€10 either by Debit/Credit card or PayPal (Deposits made with E-wallets, including Skrill, Paysafe, Neteller etc, will not count towards this promotion). Then, you will need to place a SINGLE Sportsbook (Fixed Odds) bet (minimum stake £/€10) at odds of at least 1.2 (1/5) within 30 days of opening your account. Place your bet on ANY Sportsbook market. Exchange bets are excluded from this promotion. Within 24 hours of your qualifying bet being accepted, you will be offered £/€30 in free bets.